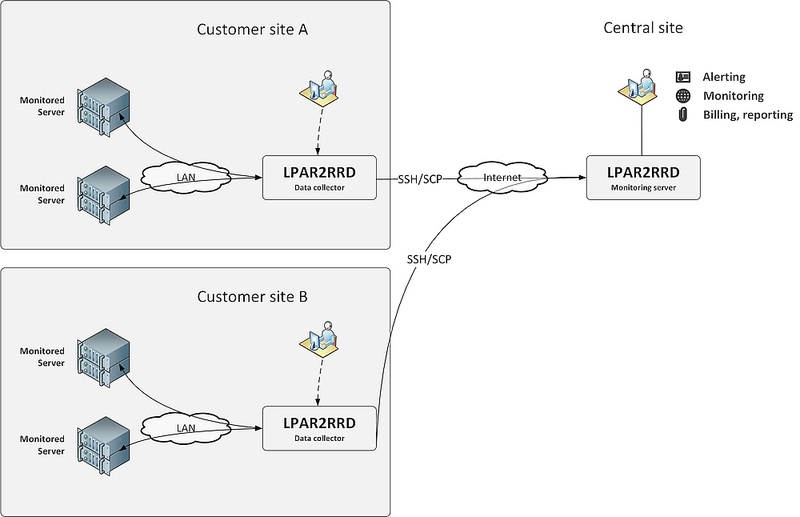 You can run LPAR2RRD data collector on a customer (remote) site to collect data and transfer it to the provider (central) site where device data is stored in the database and presented. Data collector does not keep data locally in the database, it just forwards all to the provider (central) site. You are a service provider and you want to get customer's storage performance data on your site to present it there. Your company has several geographically separated sites and security does not allow you connect all monitored devices from one central point. This feature is available only for customers under premium support level. Note: as of LPAR2RRD v6.00 VMware monitoring does not support this feature.